The terrorists who shot and injured 9 Israelis at the Ofra junction on Sunday, Dec. 9 were sent by Hamas. They are part of the same Hamas squad which murdered two Israelis, Ziv Hajbi and Kim Levengrund, at the Barkan industrial center on Oct. 7 and got away. So long as those killers were at large, IDF and Shin Bet investigators had expected Hamas to use them to strike again. The Palestinian Ashraf Naalawa, 23, from the village of Sweika near Tulkarmm, who is still on the run, was presented as the lone killer at Barkan. But he was not alone and the manhunt is in fact focusing on a large squad of at least five to eight terrorists, all of them mobilized by Hamas to unleash a major campaign of terror in Judea and Samaria. It had been hoped that when they surfaced for their next attack – possibly on the anniversary of the Barkan hit, it would be possible to lay hands on them. But again, after the drive-by shooting at Ofra, when the pregnant Shira Ish-Ran was deliberately targeted, the shooters got away. 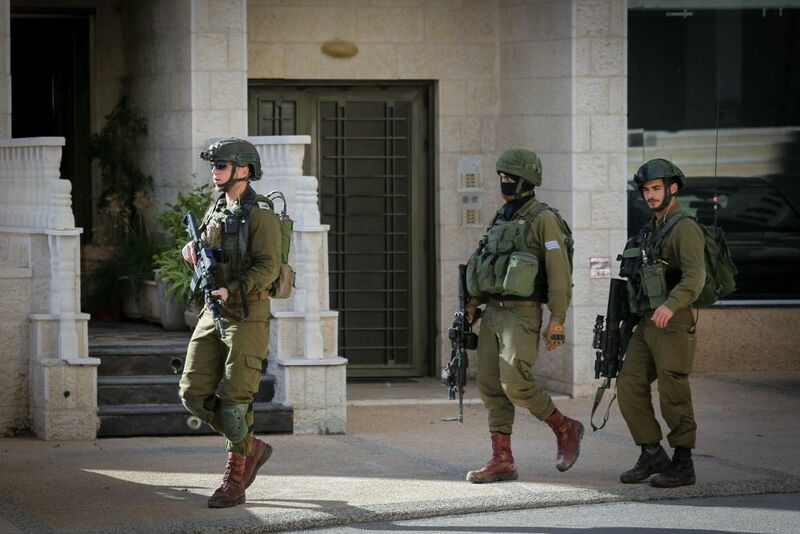 Raids and searches by IDF units in a number of Palestinian towns and villages, including Ramallah and El-Bireh, failed to turn up any lead to the fugitives and the investigation must again rely on intelligence informants. On Tuesday night, Dec. 11, security was finally boosted in Judea and Samaria. The IDF reinforcements were charged with securing road traffic, while other units had their hands full hunting for the escaped terrorists. But, so long as the killers are on the loose, their main mission is to be on the spot for anticipating and cutting short the next Hamas strike. The IDF and Shin Bet have identified the hand behind the latest round of terror as Gaza-based Abdel Rahman Jinmati, who is in charge of terrorist operations on the West Bank and the right hand of Saleh al-Arouri, overall chief of Hamas terror. During the eight months of Palestinian turbulence on the Gaza front, Israeli security forces were able to keep the lid on Hamas efforts, oiled with substantial funding, to establish West Bank terrorist networks as well as thwarting attempts to launch attacks. But in late November, when Hamas began easing up on aggression from the Gaza Strip upon receipt of Qatari dollars, the Gaza-based terrorist organization succeeded in setting up an active infrastructure for terror in Judea and Samaria, which has so far eluded discovery by Israel’s security and intelligence authorities. In the past three months, Hamas has pulled off a string of successes against Israel: One was the murderous Barkan attack on Oct. 7. Then, on Nov. 11, the Palestinian group uncovered an Israeli covert force which had operated for several weeks in the Khan Younes district of southern Gaza. An IDF colonel was killed in the ensuing firefight. Whereupon Hamas loosed nearly 500 rockets against Israeli communities. Nonetheless, the Israeli government decided against retaliation for the outrageous assault on a civilian population and instead, agreed to a ceasefire bought from Hamas by Qatar’s $90m payout. The first two of six $15m instalments are already in Hamas hands. The price paid by Israel? The drive-by shooting at the Ofra junction was the down-payment. Its youngest victim, a baby, is in mortal danger two days after being delivered prematurely from its injured mother. Palestinian terrorist groups are celebrating what they perceive as Hamas’s extraordinary feats against Israel’s army and security authorities. In this atmosphere, a further upsurge of Palestinian terror is to be expected. the stonage nazi hamass scum for further terror ! The God of Israel has vowed to curse you…So watch ur 6 carefully, because terror will come to YOU – to switzerland, norway + iceland…. Maybe they have in their banks a lot of the OPEC’s billions? Just asking, nothing else. Europ never recognized the legitmacy of jews to live anywhere, that’s why they were exterminated. How can you expect from them to have a heavy hand agaisnt Hamas ? After the Shoah Europ needs proxys. Time and struggle to a normal life made the jewish people strong and invincible . Watch out , it is time to stand up and destroy all the jew haters . Never , never , never ever again . UN too busy drawing up love letters to Killerstinians to notice. Killerstinians measure success like the beasts they are. Where are Israel’s supposed new friend’s in the Sunni world to disavow terrorism and antisemitism– too busy slaughtering their enemies in foreign embassies? Where are the nation’s of the world to sanction and punish Islamic terrorists targeting Israel – too busy drawing up fake condemnations of Israel in the UN to notice real hate and violence in Islamic world and their darling Terrorstinisns in particular? Flight QFZ 9951, (Boeing 747 Cargo) left Damascus at 13.30. Arms delivery to hizballah completed. $90 million in aid is child’s play. White european antisemites who busy themselves with the murder of 4-year-old semitic arabs (https://www.timesofisrael.com/gazan-child-succumbs-to-shrapnel-wounds-from-idf-bullet-hamas-official-says/) get a big fat $10 million check from Uncle Sam every day. Hamas is not a semite, but an antisemite baby killer. Kills Jewish babies with weapons, and uses it’s own babies as a shield to attack from behind, so that it will be killed as a collaterol damage, for which, cynically they will blame Israel. IDF will find them. A question of time. Trust them. The IDF needs to return to targeted killing of the Hamas leadership starting with Gaza-based Abdel Rahman Jinmati. After him, just go down the line from the bottom up. It will get Hamas’s attention. Sounds like Hama’s needs to do large scale targeted killing of the Zionists living in the occupied territories by poisoning the water supplies and release of anthrax within the major cities.. The longer Israel waits to eventually use force against hamas, the worse it will be for Israeli casualties, both IDF and innocent civilians. While Israel waits, hamas receives $15 million a month, to build more tunnels and obtain more lethal weapons. And they modify their terror atracks against innocent israeli civilians. Now hezbollah will be copying the success of hamas. Israel is appearing weaker and weaker. hamas and hezbollah are getting stronger and bolder. They are laughing at Israel. Israel Must deal with these problems now, to avoid the inevitable future larger problems. hamas is unofficial army of palestinian authority. please , let israel people sort palestinians out ; no need of tsahal . civilians only can settle such a situation . Civilians AGAINST Civilians since palestinian terrorists are “civilians” !! Civilians don’t pick up conviction while tsahal will .